i made my own soup before i even knew how to spell it. at my montessory kindergarten, there was a proper oven and stove, one that really worked and heated up nicely. i was totally fond of the thing and volunteered in making soup for all of the kids, on every occasion. some 30 (cough) years later, i still like making (and slurping) soups. when i know i should incorporate something healthy, for example, i’m always relying on soups to do the trick. you can pack in as many nutrient rich greens and vegs as you want and it will still taste hearty, without being to heavy. granted, my knowledge about the asian cuisine is pretty superficial. yet, i find it pretty intuitive to combine things (while i’m sure that’s probably not “comme il faut”…). 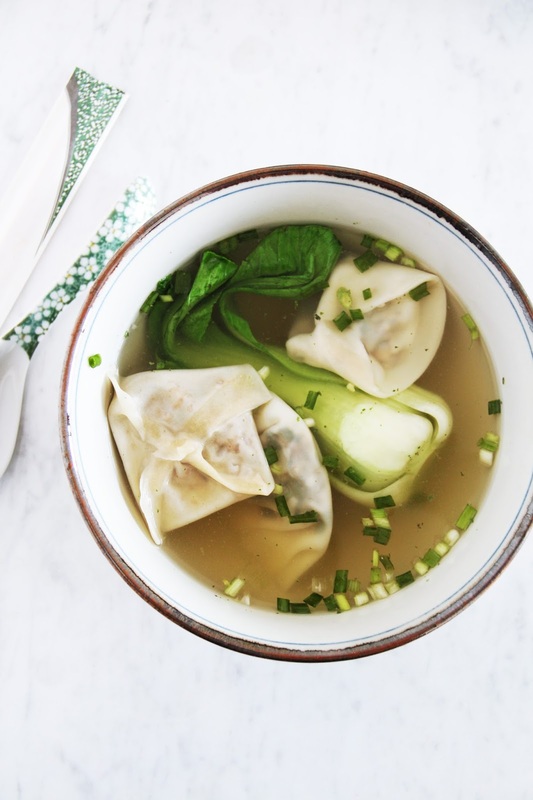 so i combine wontons in a miso broth, naturally, making it a chinese-japanese fusion (of sorts). as is my tea china. ahem. it’s probably the same as comparing switzerland to sweden (we’ve been there) but hey, at least they’re both in europe, right? 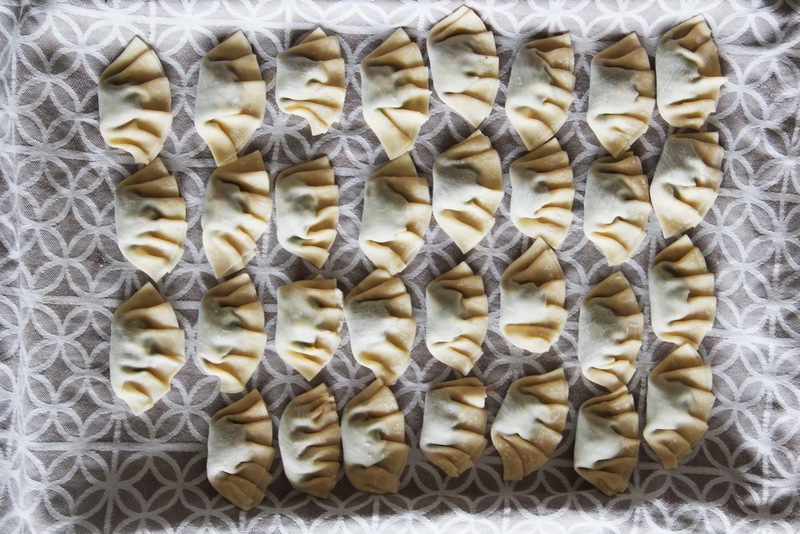 for the dumplings, defrost the wonton or gyoza skins. for the filling prepare the spinach first. wash the leaves, pick over and put in a bowl. 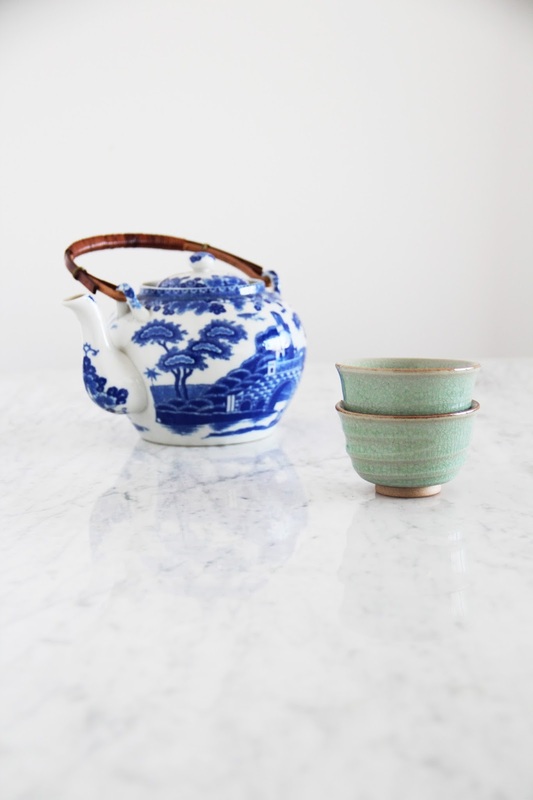 pour over boiling water (from the tea pot) and let wilt for 1-2 minutes. drain, squeeze out to remove any excess water and pat dry. chop very finely and put in a bowl. add the finely chopped shiitake, garlic, ginger and spring onions. season with soy sauce and sriracha. the filling shouldn’t be too moist, but the soy sauce adds a lovely taste to the filling. 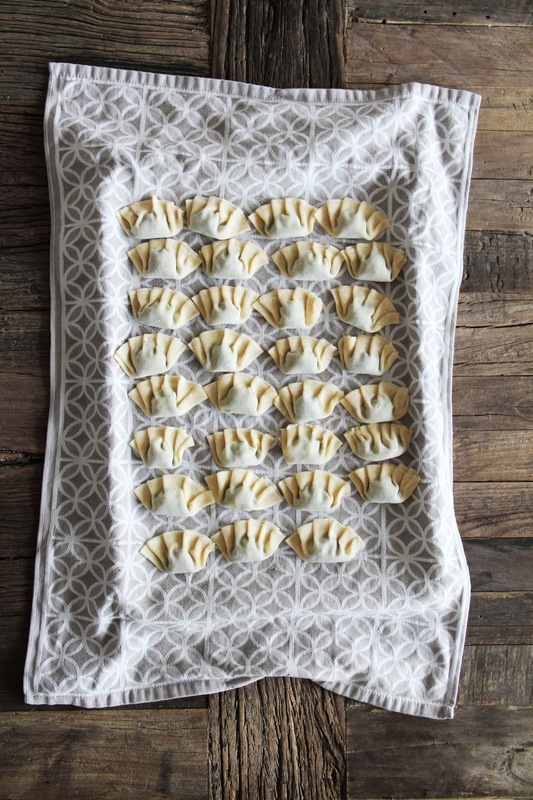 for the wontons, keep the skins hidden under a moist kitchen towel while producing them, so they don’t dry out. take one skin at a time and place a teaspoon full of the shiitake filling in the middle. brush the rim of the skin with a wet finger, then fold the dumpling to a half moon shape, removing any excess air from the inside out as you go. 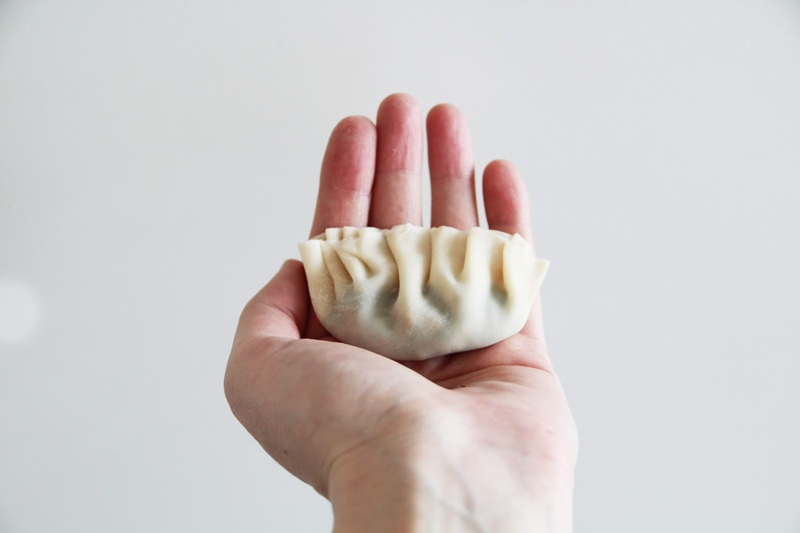 take the dumpling in your hands and fold in little “pleats” now (they add extra stability – besides looking neat). 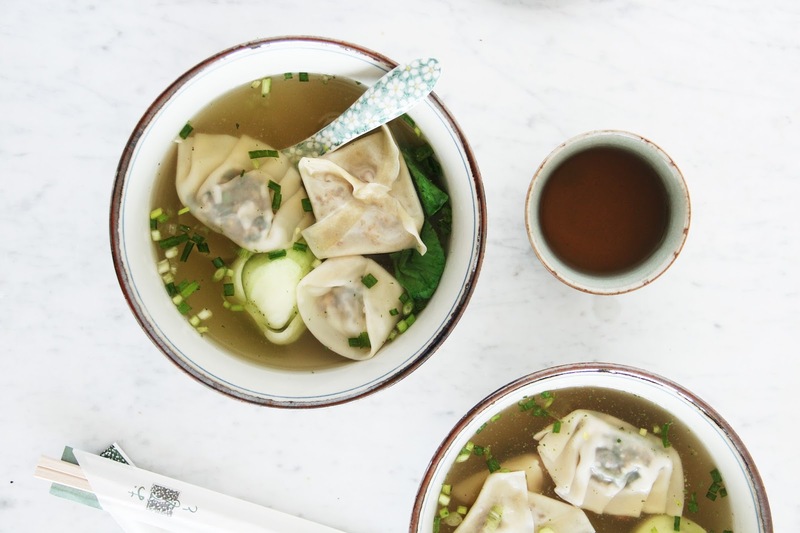 per person, you might want to make around 6 to 10 dumplings (depending on what other additions – like ramen or vegs – you plan on adding to your soup). 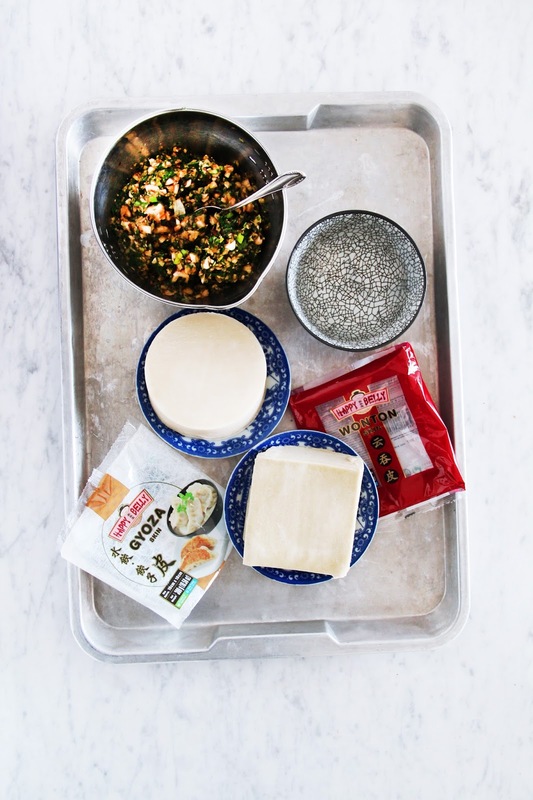 spread the finished dumplings on a clean kitchen towel and refrigerate until used – or freeze, at this point, for later usage. for the miso broth firstly start by julienning the ginger. add it to a large pot together with the vegetable broth and/or miso powder (i used about half and half of each) and the dried shiitake (that you can remove after cooking – they’re just for the lovely taste). bring to a boil. 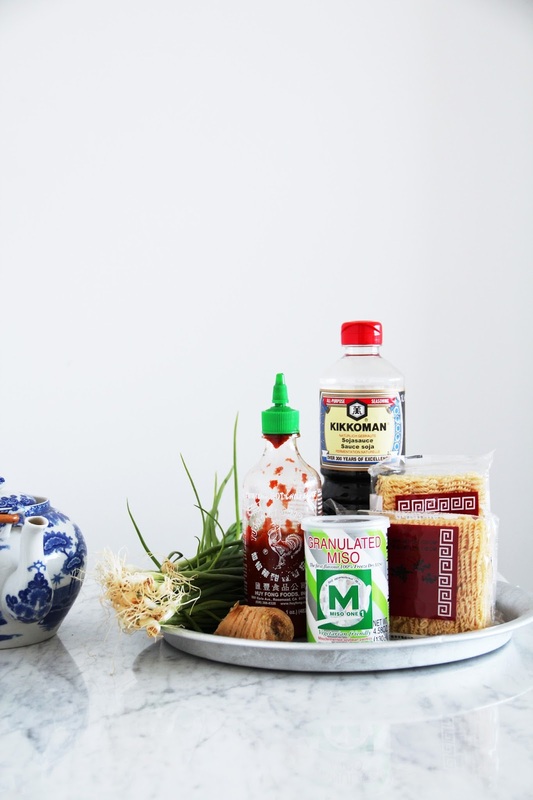 this is the basis for the soup that you can now refine – to taste – with soy sauce (for saltiness), sriracha sauce or chili powder (for spiciness) etc. 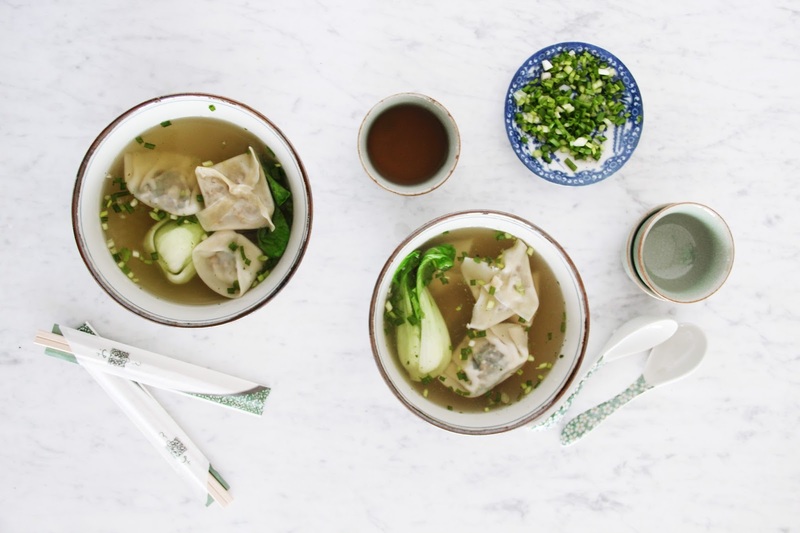 keep the bok choi, julienned carrots and sliced spring onions at the ready as soup additions. 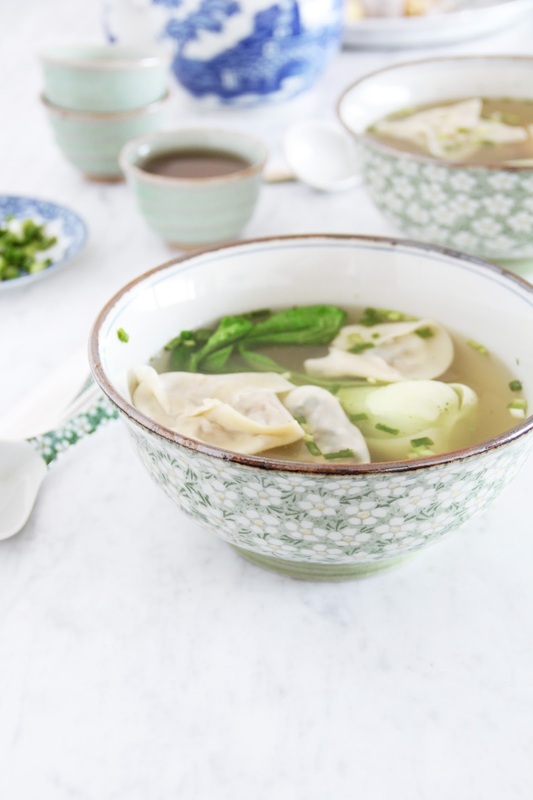 to finish the soup, quickly blanch (in simmering – not boiling water) the wontons in batches (just the ones you will need for your first serving of soup). they’re ready when they float on the top, which takes about 2-3 minutes. carefully remove them with a sieve and keep ready on a wooden board (careful, they are quite sticky when blanched) – or already divide between the bowls. shortly before serving add the bok choi and carrots to the broth and heat through, just a few seconds. ladle the broth into the bowls, adding bok choi and carrots, place the dumplings on top (some might drown, others float on the top, neatly) and sprinkle with spring onions. serve hot and with love. 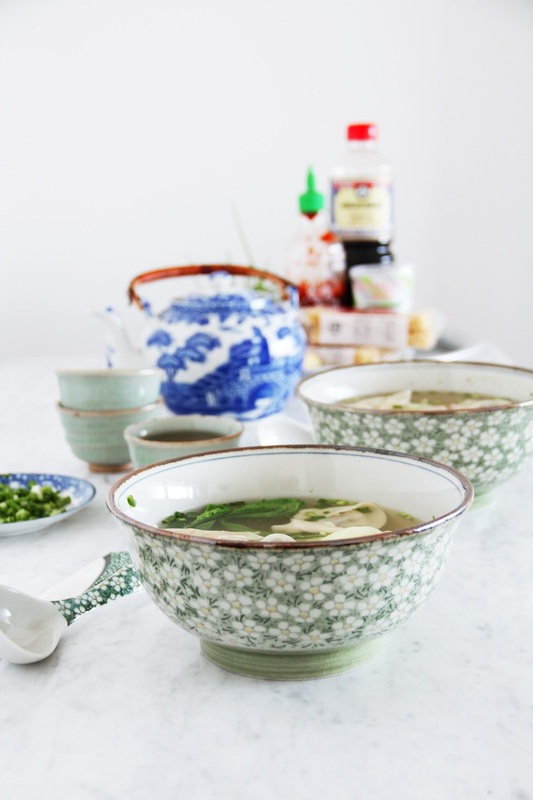 i always serve the condiments aside for my guests to custom make and refine their soup according to their taste. the things that are essentials for a good asian (chinese-japanese fusion, if you want) broth according to me are: soy sauce, rice wine vinegar, sriracha hot chili sauce, chili powders (i have it in various heats and colours, even a black one that is very fancy and evil looking, harr), sesame, miso powders and maybe even pickled ginger. 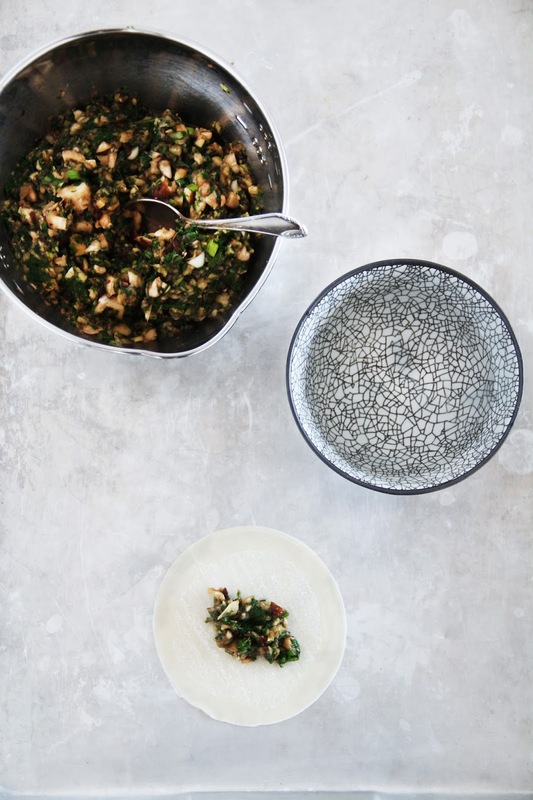 you can even put bowls of scallions, sprouts, blanched edamame, shiso sprouts or herbs (cilantro is nice) on the table for the guests to pick their favorites. 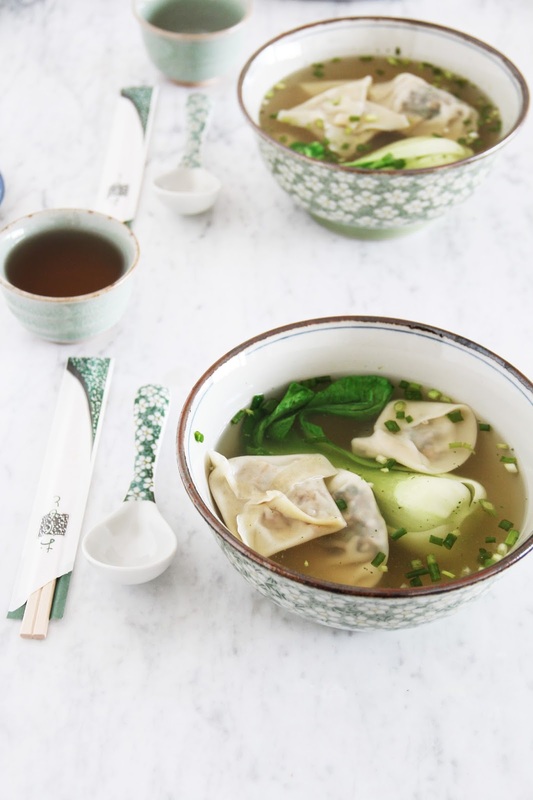 for a different – and particularly hearty – version, add some noodles to the dumplings soup! 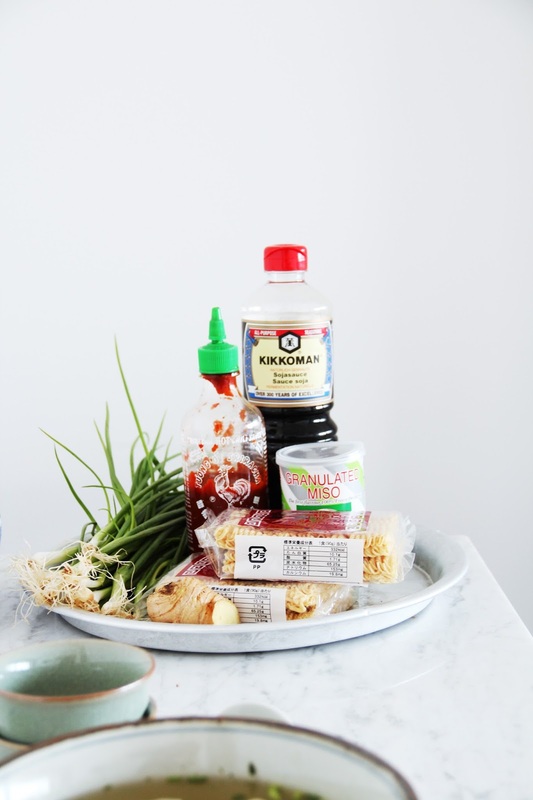 i like rice noodles, udon or soba, on some nights, but my favorites are the rumpled and nest-like ramen (egg noodles), that you might know form one-pot ready meals. you can pick them up at a well stocked delicatessen or an asian shop. they’re usually ready in a couple of minutes. my go to noodles for everything that’s not italian pasta. What a beautiful, delicate looking soup. 🙂 how did it turn out, melissa? i'm always curious to know. thank you! delicate is such a nice word to describe food. so going to copy it :)) hehe.